Frida Kahlo: Dress and Identity Many aspects of Frida Kahlo have been studied, pondered and admired. From her art, politics, love life, travails, and many others. A singular aspect of Frida Kahlo and her identity was her dress. Frida used dress consciously in the creation of her identity. Through dress, she crafted her image, displaying her cultural heritage from both Europe and Mexico. Traditions & Flavors of Oaxaca: Anytime! Oaxaca has become a “hot spot” for culinary travel, yet its foods are ancestral. From native corn, to the land of mole and mezcal, Oaxaca is a place to savor with all the senses. This culinary journey will take you on a veritable historic journey, beginning with the ancestral foods, the sustenance of Mexico today, and will also showcase contemporary expressions of these heritage foods. Join us to Oaxaca and Veracruz on The WARP (Weave a Real Peace) Annual Meeting Trip: “In the Footsteps of Irmgard Weitlaner-Johnson”. The post-Tour: “The Art of the Ikat Rebozo: Traditions and Techniques”. And the Workshop: “Natural Dye One-Day” with the master dyers of the Centro de Arte Zapoteco Bii Dauu to learn of their ancient techniques and masterful use of working with natural dyes. This extraordinary journey takes us to singular and diverse regions of Mexico in Oaxaca, Puebla, Tlaxcala and Mexico City. Not only will we be able to appreciate the vast diversity of Mexico, we’ll learn about the varied textile traditions in natural dyes, weaving and embroidery. We’ll savor new flavors, meet artisans and visit ancient archeological sites! Join us on this journey to a different Mexico!. Based in Oaxaca City, we’ll explore Oaxaca, and the surrounding communities of the Central Valleys. 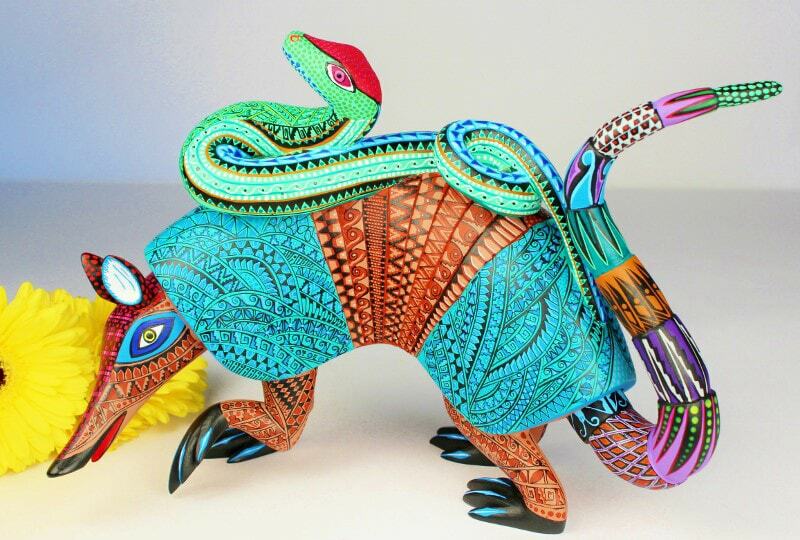 Communities such as: San Bartolo Coyotepec, known for its black pottery; San Martin Tilcajete, for its whimsical carved wood “alebrijes” and to Teotitlan del Valle, where we will meet extraordinary weavers and dyers in this legendary “tapestry” weaving town…. We explore the multiple ethnic communities of Oaxaca (and Guerrero) to learn of their cultural and ethnic expressions in dress and textiles. From the Amuzgo in Guerrero to the Mixtec, Huave, Zapotec in Oaxaca we will see how textile traditions and dress are a cultural passport and unique expression of the women (and some men) who live in this region. A not to be missed annual Oaxaca event, the Guelaguetza is a celebration of Oaxaca’s regional costume and dance in honor of the pre-Hispanic goddess of corn, Centeotl. Villagers in full regalia arrive from their respective villages to put on a spectacle of dance and music. Join us in the small villages to celebrate this most colorful and memorable spectacle!